Discussion in 'Replica Costumes' started by Mega Gigan, Mar 3, 2006. I was wondering, is this basically a "Anything goes" type of suit? You can basically do whatever, as long as the helmet and the armor looks basically the same? 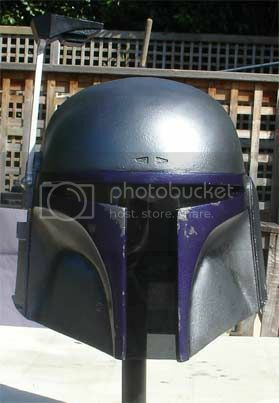 I have a Fett helmet that I was just planning to do a custom fett (because Boba and Jango fett go way above my talents.). Also I'm sure some of you have pictures of custom fetts too. May I see them? We've got a few in the Southern Outpost(not officially of course). 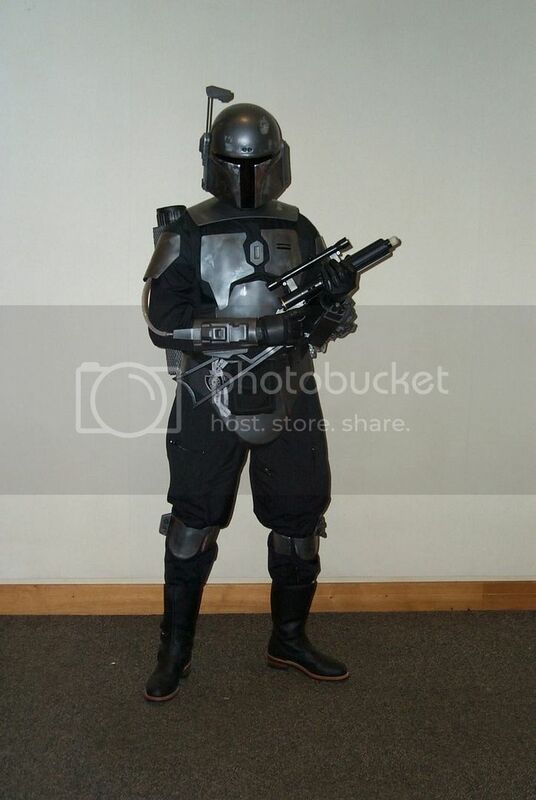 But you shouldn't do one just because you don't think you can cut it as a Boba or Jango(enough people see it that way as it is). If you want a Boba, do a Boba. It may take a while, but in the end it's worth it when you've finally put together the suit you wanted rather than the suit you had to settle for. However, if you're looking for an outfit where you can put your own designs and creativity into play and have it just the way you want it the custom Mando can be a lot of fun to build and wear. Ignore the pulse rifle. It's not part of the regular getup. I'm just looking for a costume that I really want my imagination to go crazy on. I want to get away from being uber accurate a little bit and try my own style of things for a little mix up chango. Those are some awesome pictures though, thanks for sharing. I know some of these photos had been posted here before, but thought I'd share since there is this new thread. The wife wanted a custom mandalorian. So a friend and I built her one. Ther onlu fiberglass on this thing is the cod piece. The rest is beveled 1/4 inch sintra. Jetpack and Gaunltlets are Styrne (I believe), Guns are hyperfirm rubber and one of a kind. Jumpsuit is Skygunbro. Maybe this will help give you some ideas. Of course there is still Gloves, Jet Pack, Rifle, and jumpsuit. But you get the idea. LOL. I'm doing a hardware store Mandalorian for my 10yo daughter. Still needed are, gauntlets, flightsuit, jetpack and armour I'm making from sheets of styrene I got from the local hobby shop. Helmet's a DP95. So far I've spent about $40, not including the helmet. I must say that it's a fun build, so much fun, I'm thinking of doing one for myself. The wife wanted a custom mandalorian.Â So a friend and I built her one. Awesome colors. I like those contrasting metallic shades. Heres a link to some of my costume pics. That's a buddy of mine. I'll ask him, or just point him to the thread. Ok, here's what he said. Hammer, I used a red from the Wal-Mart automotive department.Â It does have a fine metallic fleck to it, but it is much richer than standard paints; it does cost a bit more though.Â Same with the gun metal gray, also from automotive.Â Both the paints look great sprayed over a silver undercoat, using toothpaste to create a chipped paint affect. I was not happy with the gloss on the gray, since as a sniper I need to keep a low IR profile.Â To remedy this I took 400 grit sandpaper and gently took off the shine; it looks much better now. 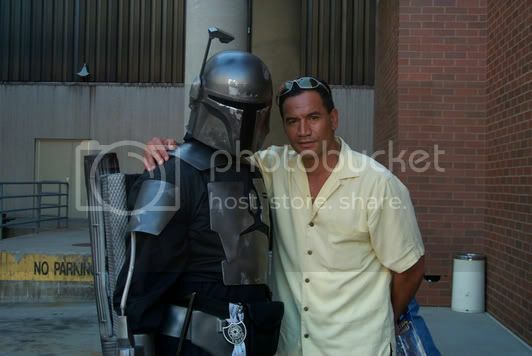 This Fett is cool, but looks dead on like something out of GI Joe...pose, colors and picture frame. I was not happy with the gloss on the gray, since as a sniper I need to keep a low IR profile. Than why the screeming bright red? Keeping a low IR profile to avoid long-range sensor detection can get you in close enough to take out your target while still out of visual range. So it doesn't matter what color the armor is, especially under the ghillie suit. Took me all of 1 minute to figure that out. Or, for a more realistic answer, it looks cool. Take a good, hard look at the outfits in the SW movies and tell me they're practical for combat. Whoa guys, take it easy there. No need for "discussions" about the nitty gritty details. 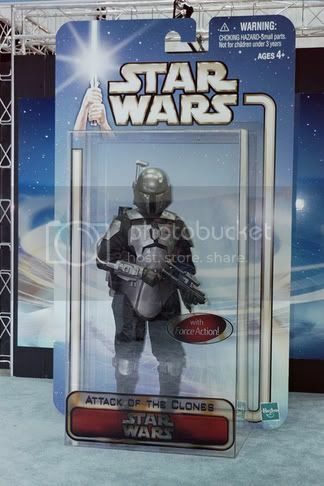 It's just a cool looking custom fett, you know? Anyway I've started to embark on my own Fett. I will be making mine a custom "Tech" fett glowing lights and the bells and whistles. Places to get custom glasses made?